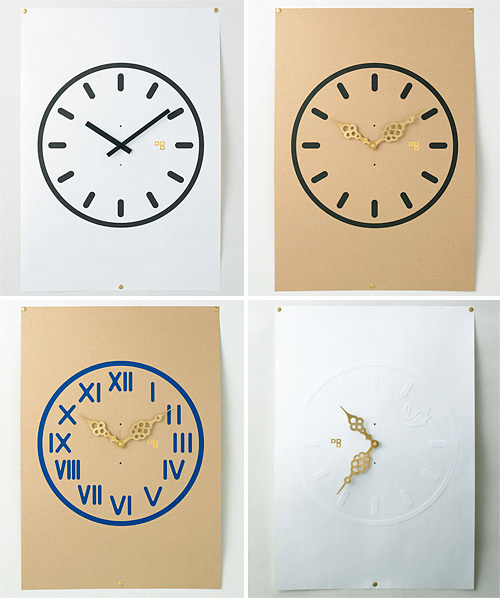 'Time Paper' Clock Posters Make It Easy To Redecorate | OhGizmo! Wall clocks are pretty much just a decorative item these days, and these ‘Time Paper’ poster clocks make frequent redecorating easy and guilt-free. They’re quite literally just composed of a poster printed with a clock face design and a simple clock mechanism hidden behind it. When you get sick of the design you just rip down the poster and recycle it, and then throw up a new poster with a handful of thumb tacks. It’s just too bad they range in price from ~$63 (¥5,250) up to ~$88 (¥7,350) from Boo-Hoo-Woo.com.